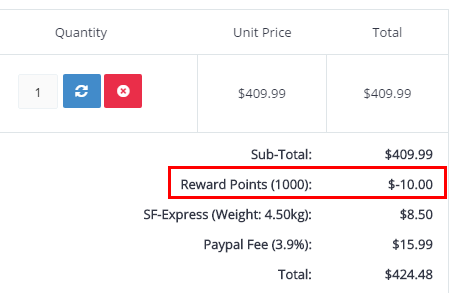 You can earn Points for every purchase you make on ucobd.com. Any Points you earn can be used towards your future purchases online. Simply make a purchase online and you’ll earn Points against your account. For every $10 you spend you’ll earn 10 Reward Points. 100 Rewards Points = $1 which can be used towards any future purchases at ucobd.com. You can redeem your Reward Points at checkout when shopping online. You can choose the amount you’d like to use. Yes you need to be registered to earn and spend Reward Points. Registering an account is easy, and can be done prior to placing your first order, or as part of the checkout process. Once you're registered, simply sign in to your account before placing any orders. Each time you make a purchase you’ll then earn Points, which will be available for you to use at checkout on future orders. Any Reward Points earned will be available as soon as your order has been sent. You can check your balance at any time through the Reward Points section of your account. You can redeem your Reward Points online through www.ucobd.com. You can view and manage your Reward Points through the Reward Points section of your account. Here you’ll find your total Points balance, along with a cumulative history of all your Points acquired and redeemed. Yes definitely. Points can be used to pay for part of your purchase in conjunction with other payment methods such as credit cards and PayPal. Reward Points are not legal tender and are in no way redeemable for cash or any other benefit. They are redeemable exclusively on www.ucobd.com.